When Ines Brandao Arquitectura were designing this small apartment, they including a closet specifically designed to add storage and create a separate space for the family cat. The wood closet has two doors. On one side, there’s room for a washing machine and plenty of storage, and on the other side, there’s a counter, bike rack, access to a door, and a space where the family cat can eat. 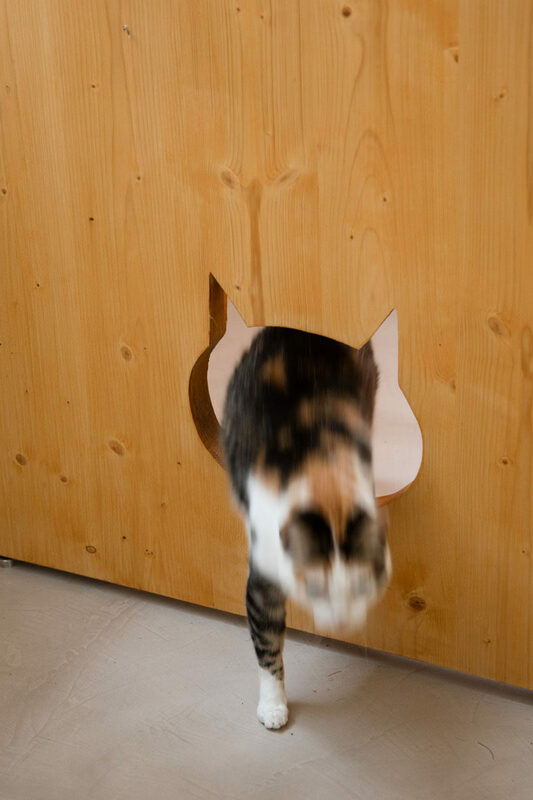 When the doors are open, the cat dishes are visible, and when closed, one of the wood doors has a simple decorative cut-out of a cat face, that also doubles as a cat door and allows the cat to have easy access to their food and water.